Why waste your money on pathetic wind power - that's only suitable for a home on a remote island where it would be too expensive to provide cable connected electricity. The only real/usable renewable/clean/green power that's worth investing in is TIDAL Power. It's guaranteed/predictable electricity generation - Wind and Solar are both inefficient, unpredictable and expensive. If you're gonna do all that, why not set up some solar cells also in the center of each hexa-pad and boost energy production in cooperation with the wind turbines as well as tidal current turbines/generators? Yeah, something doesn't sound right about the math. One of these should be able to supply enough power for a few hundred homes, not a single home. 10Kw per 112M hoop? that\'s HORRIBLE. even a regular 112M wind turbine generates 4.5 MEGAWATTS.. which is enough for... not one home but... 450 homes. 1 home!? you can generate enough wind power for ONE home with a 12 foot wind turbine... that\'s more than 30x shorter than each of these huge hoops. I sincerely recommend that the author of this article checks their math. You mean one of today\'s turbines DOESN\'T provide one home\'s worth of power? Even with the advances of the this design, there isn\'t land or sea to provide the world\'s power. C\'mon fusion, we need ya baby! I think the professor spent too much time staring at Dyson\\\'s Air Multiplier fan at Best Buy. How could a professor design such a laughable thing? He should go draw comic books. This totally has no knowledge of wind nor physics. Hello...wake up...he prob stayed in teh ivory tower for too long. Hywind & Sway's spar...it is a joke...US$4/MW!!!!! Even the RI attorney general filed an appeal to stop this PPA. Please review your article, Ariel. There must be a typo or that idea is completely useless: Each turbine can provide energy for ONE average household? How many turbines we need for one city? Jacques Fresco's ideas will finally going to take shape. See more his thoughts and visions on Youtube using his name in search. wherever they have got the info about it powering 1 household, that is definately way off. i know that the largest current wind turbines can power thousands of homes. a news sites have made this mistake and its advisable they change this statement before the efforts towards wind technology lose credibility somewhat. 3x the power is exciting however! So, let me get this straight. Something nearly the size of a city block can now power one home given ideal conditions? That whole complex up there is the size of an island, yet couldn't even power one residential neighborhood. This is a "super efficient" breakthrough? How is wind power supposed to viable on a large scale again? That begin said, anyone else notice the artist adding in the flock of birds flying harmlessly past this thing? Interesting design, but needs a few footnotes. First, you generally have to maintain a greater distance between turbines. The \"upwind\" turbine will reduce the energy available to the \"downwind\" turbine if they are spaced too closely. Second, when calculating how many homes can be served by any particular wind turbine, one has to consider the turbine\'s capacity factor. In other words, what percentage of the time will the energy be available? Onshore installations produce about 35 percent of their capacity, while offshore installations promise as much as 45 percent of capacity. This compares to about 90 percent or more from conventional gas, coal-fired or nuclear plants. As we build more and more wind turbine facilities across a greater geographic area, they will offset a bit of their own lack of useful capacity. Other comments are correct in their explanation that we need substantial additional investment in transmission capacity in order to make use of wind energy. The current grid connects major sources to major load centers and was not built to accommodate hundreds of smaller wind and solar sources. In other words, energy will never be cheap, but will ultimately be cleaner. Energy conservation and optimization are the least expensive ways to control energy costs and keep the lights on. Please join me here next week for \"Electric Cars 101: Why we don\'t need to rebuild the distribution system to accommodate them.\"
I hope the rim-supported turbine is also an artist's interpretation. If not, the hoop will need roller bearings spread out over the inside of its ~320 m circumference to support the turbine rim; bearings moving at high speed, constantly doused by salt spray ... sound expensive, heavy, and unreliable to you? Sadly, Ariel is a bit confused what the wind lens is. It isn't the floating honeycomb structure; that's just "artist's impression". The lens is the shroud that goes around the (traditional three blade) turbine. As such, the 112m diameter figure quoted is probably about right, given that 50m long blades are not uncommon in utility-grade turbines. As to their commercial viability, it will be the usual balance between the extra cost for the extra power. While the lens may double the power output, the extra mass required might make it unsuitable for high towers, necessitating construction close to the surface, as in the image above. Wind speeds are lower near the surface, however, so the power output of the turbine will be lower and the gains provided by the lens may be negated. Given all that, as justaguess says it may enable deep-water floating installations to be constructed more cheaply, as there is less turning force on the turbine. And given that, we should remember that lots of power out in the middle of the ocean isn't much good to us; we would need to spend more on transmitting the power back to shore (and losing some of it in the process). It might be a really good idea for small-scale installations, where a cheap plastic shroud could do the job for very little increased cost. Floating platforms are having the big advantage that they can set up in water deeper than 30-70 m. The wind energy offshore potential of the US included deppwater is enough to provide the US with energy. So floating could be the future, but it is more likely that it will be a single floating turbine like the HyWind or SWAY concept! "Each Lens, which measures 112 meters in diameter, can provide enough energy for an average household" I'd say that that is a typo... if you follow the "+ Wind Lens Turbine" link you will see that a test of a 1.38m turbine produced 1Kw of power. I'm guessing that the turbines are attached to this hexagon platform rather than to the sea floor as with other offshore turbines. seems like a lot of structure. the platform is double the size of it's neighboring island. other than looking cool, is there any advantage to using the platform instead of the traditional method? This can make a great fish farm structure? This is only fantasie. The monetary system is NOT allow to build this. 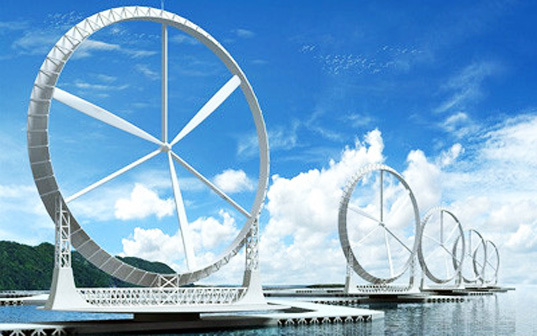 Forget about traditional tri-blade wind turbines -- the ultra-efficient turbine of the future might look completely different if Kyushu University professor Yuji Ohya has anything to say about it. 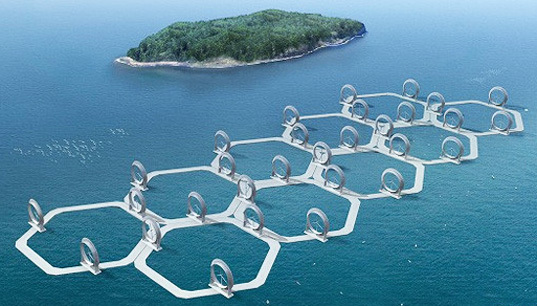 Ohya and his team recently unveiled the Wind Lens, a honeycomb-like structure that purportedly triples the amount of wind energy that can be produced by offshore turbines.